Discussion in 'K-POP' started by g_dra_gone_drunk, Aug 15, 2016. Q. What made you want to become an artist? 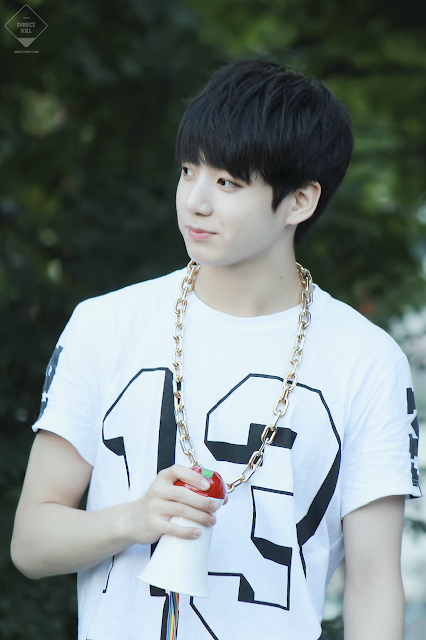 Jungkook even spoke and said hello to G-Dragon hyung (?)!! 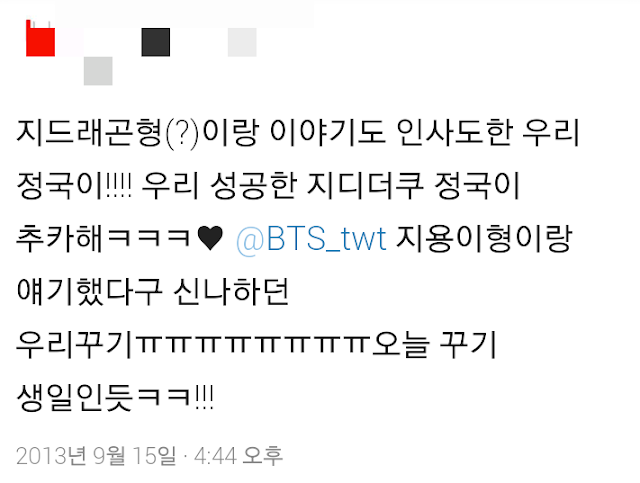 Congrats successful G-Dragon fanboy Jungkook ㅋㅋㅋ♥ Our Kookie was really excited because he got to speak with Jiyong hyungㅠㅠㅠㅠㅠㅠㅠ looks like today's Kookie's birthdayㅋㅋ!! hallcinatingvip, Angryb, HannaLau and 2 others like this. This is soo cute jungkook talking to his idol. Is the cutest thing. 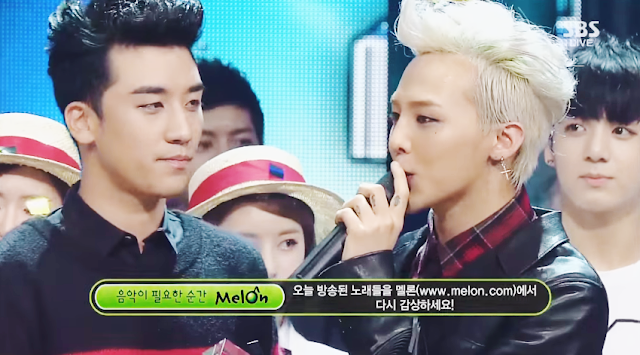 Gdragon is a such a good sunbae to many Junior and rookie groups. Soo much respect to big bang. to be honest I only considered Gdragon as sunbae to other idols , the other big bang members didn't acheive the level of GD , yeah T.O.P is amazing actor but in idol or as rapper he is average and didn't achieve much , same for taeyang eventhought his last solo comeback was daebak I feel like he still haven't reached GD level .. and after daesung accident he haven't been to variety shows as much and only active in japan .. I don't think I need to talk about sengeri . Are you.. Are you new in kpop?? I honestly doubt that anyone that has been in kpop for at least a year could think that only GD is big from BB?!? I'm not a VIP (actually an exol) but I still respect BB as the KINGS of kpop right now. They have been on top for 10 YEARS! 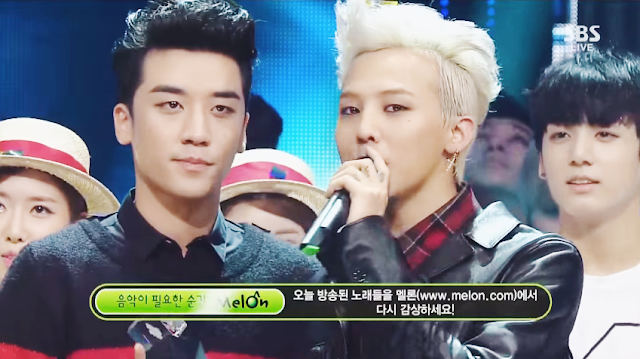 And while GD is probably the most sucessful, BB wouldn't be BB without the other members! All of them are respected as sunbaes because they all have EARN it! I really don't know if you havent been here for too long or are just trolling me xD Big Bang as a whole are kings And they are all respected as kings because they have earn those tittles. hallcinatingvip, hinote, mamamoobts and 2 others like this. Aaaaawwwwww this is so cute!! Really? Anyone who debuted earlier than another artist is their senior/sunbae. And I Gotta Talk To U about Seungri (because I need to refute your sass, and because I know more about him than the other members) - are you kidding? 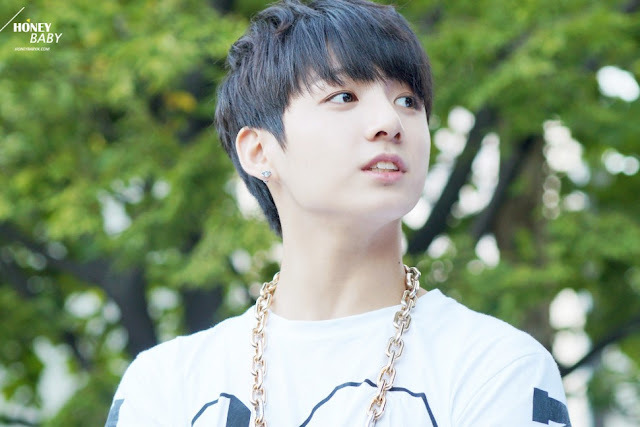 He owns his own dance school (is the CEO) where many younger idols have learned, INCLUDING BTS' J Hope. He owns a restaurant. He takes part in the production of his own songs, is on so many variety shows and makes attempts at learning the language of most countries he goes to ("makes an attempt" meaning he rarely becomes fluent but definitely knows more than mere conversational skills). GD is the most popular, for sure. But if we're going to talk about scandals (because you seem to want to), he had that drug scandal. Does it make him less of a person? No. But why didn't you care to mention his scandal if all of the other members are apparently dragged down by theirs? e. Seungri's an actor too. BUT, MOST IMPORTANTLY, he has some damn iconic tweets. iisstf28, hinote, Envyy and 1 other person like this. iisstf28 and SMisBAE like this. Aww that's cute. I wanna see the video tho. BTS is seriously BIGBANG's biggest fanboy among other idols that I know. I hope one day they will be recognized by bigbang members lol.